Medals have been used as a form of recognition since the 4th century BCE. There are at least 7 classes of medals that you can customise and use as an award, commemorative, souvenir or so much more. Running medals are our main selling product, however, you can order from us medals for any kind of events. If you’re organising a competition, we can help you choose and customise medals for kids, race and dance medals or even golf medals. Any design you have in mind, we can print or engrave it. Sports activities and personal challenges became a prominent part of people’s lives in the past years. Yearly there are over 4K marathons organised all over the world and a countless number of other running events. With over 40K people taking part in the London marathon alone, any sports challenge organised is guaranteed to be a success. To celebrate the participants’ achievements, medals are an indispensable attribute. Such a great memorabilia will be saved for years being proudly displayed to friends and family – which makes it an ideal opportunity for your brand promotion. You can have the best quality print or engravery on any of the chosen medals suitable for a vast variety of sports events. 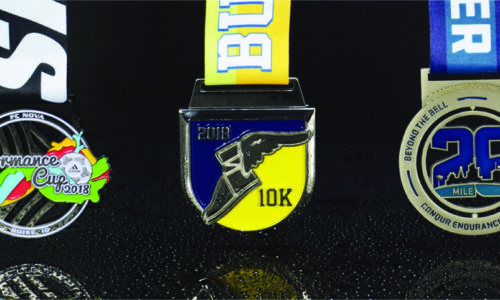 Whether you need half marathon medals, 5K, 10K or even medals for kids or fun run medals, we can find the perfect match in terms of price and quality. Numerous sports events have already benefited from our services receiving the best quality products that managed to survive the harsh conditions of the races. Some of our happy clients were The New Forest Marathon and Nuclear Races. The New Forest Marathon organisers used our Express delivery option to order 5,000 T-Shirts printed with four colours on the front and the back of the sports jersey. For Nuclear Races we delivered screen printed t-shirts with plastisol inks that are durable enough to survive a run full of mud and obstacles. If you’re planning a sports event, we can help you choose the best clothing merchandise and accessories – such as personalised medals. On our website, you can choose between gold, silver, bronze and even wooden medals. You can buy marathon medals that can be either customised using a design of your choice or leave them blank so individuals can get their individual names engraved onto them. With a winning selection of personalised medals to choose from, there’s a medal for every type of merit. We produce custom medals using zinc alloy and plate them using gilt, nickel or copper. Our medals come in any desired shape and can perfectly incorporate a bottle opener that may be handy after a fun run. With our quirky medal shapes at your service, why not organise a British version of the Boozy French Medoc Marathon? For kids race medals you might want to consider spinners that we’ll be happy to deliver to you using our numerous options for packaging, including velvet lined boxes and wooden boxes. For events with a limited budget, we are also able to supply custom wooden medals which are cheaper than custom metal medals. We cut them to specific shapes as required by our clients, but the printing and design will need to be less complicated. We produce these personalised medals using Cotton Wood or Chinese Cherry Wood but may be able to use different grains upon request. Depending on your event, objective and budget we can offer the most suitable personalisation technique that will go perfectly with your chosen medal type. Die is a heat resistant device used to compress and shape material. The intense pressures of die-striking results in porosity-free personalised medals. The process allows for 3-dimensional levels, cut-outs and window effects, spinners, rotating levels, and much more. This technique is perfect for a creative mind, it allows you to make a unique and memorable design, ideal for recognising the achievements of sports enthusiasts. Zinc Alloy die struck is an excellent method for 2D and 3D cubic designs. If you need to make miniature designs with spaces in between and mechanical functions such as spinning, then zinc alloy is a perfect choice. It is also cheaper than the brass material being one of the most preferred choices for manufacturing sports medals. By using this technique, we infuse dyes directly into specially coated aluminium sheets which is the best way to achieve a long-lasting and durable design. Personalised medals with metal print will survive any challenges as they are also scratch-resistant and waterproof. Your design will also be bright and radiant because the image is infused into the aluminium sheet, not on top of it. We can also offer a classic and stylish option of personalisation which is engraving. Using this technique, you can incorporate the recipient’s engraved name and winning time if appropriate. Whatever the occasion, our engraved sports medals are a great opportunity to commemorate a high-level achievement. This technique can be used on both metal and wooden medals. This is a process of fusing a thin layer of glass to the custom medals to prevent corrosion and enhance their beauty. You can choose between partial or full-colour enamelling. If you have any doubts or questions, our sales team will be happy to advise you on the most suitable medal shape, material and printing technique for your event. They can also guide you through our process of ordering and be in-touch whenever you need us. You can order any amount of personalised medals, however, for the price per unit we advise a minimum quantity of 50 medals. We are sure that with our prices and quality, you’ll want to order more!